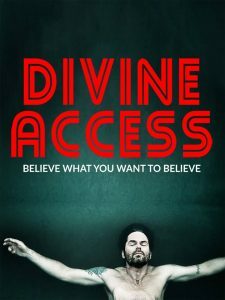 DIVINE ACCESS is equal parts comedy and drama. Set in the south, it's a road movie, a buddy picture and an often sweet, thought-provoking story of redemption. Dragged from one religious experience to another by his mother Catherine in an attempt to fulfill her own spiritual quest, Jack Harriman finds that he knows more about the world's vast religions than most scholars. Living a simple life and using his religious expertise to attract women, Jack is asked to join a local cable access television show called Divine Access, produced by his good friend Bob McCord. Bob is keenly aware of Jack's penchant for discrediting religious zealots like the current host of the show, Reverend Guy Roy Davis. Jack humiliates Reverend Davis on an episode that quickly goes viral. Jack's immediate popularity fuels a jealousy and hatred within Guy Roy sending him on a downward spiral from grace. Jack, on the other hand, becomes a spiritual celebrity and reluctantly takes to the road on a multi-city speaking tour. Along for the ride is Nigel, a self proclaimed "catcher" who earned his nickname for catching those overcome with the spirit while on the religious circuit. Jack and Nigel are joined by Amber, a down on her luck call-girl who Jack takes under his wing, and Marian, an enigmatic beauty who challenges Jack's beliefs and questions whether he has some deeper calling. When Jack realizes he has become a false prophet, the thing he despises most, forces both natural and supernatural lead him on a journey to discover his own spiritual truth, culminating in a final showdown with Guy Roy Davis. Surrounded by those he loves and those who love him, Jack's story will forever change the lives of the throngs of fans that have come to hear him speak. Ultimately, DIVINE ACCESS is a story of family, friendship and faith.